In order to show off this brilliant book to its very best, I’d love to accompany this review with a bunch of pictures. Only I can’t because there are no pictures – just words. How can that be fun for a kid’s ‘picture-book’? I promise you, it is. 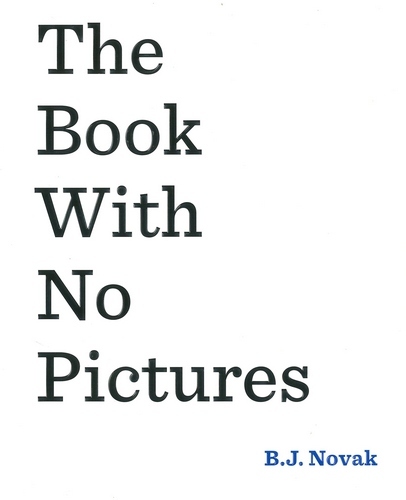 We’ve seen plenty of picture books on Babyology with no words but I’m quite sure that B. J. Novak’s The Book With No Pictures is the first non-illustrated picture book we’ve seen. The concept is simple – read the words (they’re funny, sometimes silly, and suitably crazy) – and the laughs will follow. The person reading the book doesn’t have to have any theatrical talent – no need for crazy voices or funny faces. Changes in font and text colour give the person reading the book some gentle cues such as when to pause for laughs and when to raise the volume. Other than that, the marvellous text does all the work. Take a peek at the clip below and then let a kid talk you into reading it aloud – you’ll end up saying the silliest things. The Book With No Pictures is suitable for children aged three years and over. Find it in all good bookstores or online at Book Depository.